A crew rescued off the coast of Cornwall after seven days adrift in a life raft set fire to their yacht to attract attention. The four men and one woman abandoned their yacht when it got into trouble after leaving the Republic of Ireland en route to Cherbourg in France. The raft drifted for about 90 miles, before it came into mobile phone range and the crew could raise the alarm. The crew from the Inis Mil, was treated for exhaustion and dehydration. The boat's skipper is being detained in hospital overnight for observation, but the other four crew members have been released. Coastguards said the boat was two-thirds of the way to the Isles of Scilly when the crew members were forced to abandon it. Search and rescue teams had been looking for the vessel for the past five days after the skipper's wife reported they had not reached their destination of Cherbourg after leaving from Kenmare Bay, County Kerry. After seven days of being blown around in the 6ft by 4ft life raft, the crew said it spotted windmills on the north Cornwall coast near Padstow. The crew was then able to use its last working mobile phone to call the coastguards on 999 at 0918 BST. Coastguards co-ordinating the rescue were then able to use the mobile phone signal to direct a rescue helicopter from RNAS Culdrose. The crew members were rescued three miles off Trevose Head. The five crew has been named by the Maritime and Coastguard Agency (MCA) as Frenchwoman Stephanie Preux, the owner of the vessel; 56-year-old skipper David Faulkner from Surbiton, London; Mr Faulkner's son, Ian; Australian Bjorn Bjorseth, who is currently on a gap year, and the vessel's previous German owner, Jurgen Hensel. 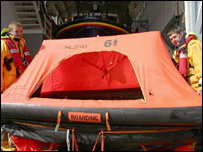 It is believed the life raft did not have a distress beacon to allow rescuers to pinpoint its position. Coastguard watch manager Martin Bidmead said: "The weather since they took to the life raft has been quite horrendous, with strong winds and rough seas over the past week. "We consider these survivors to be very lucky." The MCA says the ship started taking on water at about 0300 BST on Tuesday 7 September. It is believed the main bilge pump failed shortly afterwards. An MCA spokesman said: "The sea swell started picking up and by 0500 BST they were unable to cope." Skipper David Faulkner issued a "pan pan" warning - one down from a mayday call on the vessel's VHF radio, but the MCA said the signal was not picked up. The MCA said: "The crew saw a nearby trawler and fired flares, but presumably they didn't see him. "Then they started making mayday calls when the situation became impossible." The MCA said rubber tyres on the deck were lit as a way of creating a smoke signal. The crew abandoned the vessel about 1700 BST on 7 September and took to the life raft, then set fire to the vessel in order to create an attraction. Mr Faulkner filled the wheelhouse with petrol, put a match to it and was thrown back and singed by the blast. They then had to paddle away from the vessel to avoid the possibility of the sails which were on fire falling onto them. The crew had four litres of water, which ran out on Monday, but some food supplies were still available. They also stored urine to drink as an absolute last resort. The rescue operation involved the Padstow and Newquay lifeboats, and was co-ordinated by coastguards. The survivors are now at Royal Cornwall Hospital at Treliske, near Truro. Helicopter winchman, Lieutenant Roger Brook from 771 Squadron, said the crew appeared reasonably well under the circumstances. He said: "They were all dressed in waterproofs and had life jackets on. "But if you wear the same clothes when you're sitting in water for eight days, you're going to be very uncomfortable. "When we got them out at the landing site at Treliske, their legs certainly didn't want to move. "They had great difficulty walking and it will take a while for the circulation to come back." The former fishing boat, which had been converted into a sailing ketch, is believed to have sunk. "Just one day into their journey, the ship started taking in water"